We are a friendly home office approved rifle and muzzle loading pistol club based near Crocketford in Dumfries and Galloway. 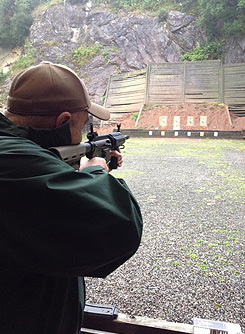 The club is owned and run by its membership in order to promote and enjoy all forms of target shooting. The club has its own 6 lane 25m outdoor range with covered firing points which is suitable for small bore rifle, LBR & LBP; pistol calibre centerfire rifle & LBR; muzzle loading pistol, revolver & rifle and practical/target shotgun. We also shoot on separate 100yard range (small bore rifle) and a 1000yard centerfire rifle range. The range is open every Sunday afternoon throughout the year and Thursday evening during the summer months. The range can also be used on any occasion when two full members are present. The website will be expanded in due course but If you require more information please e-mail us or see our Facebook page.